The wicketkeeper's technique is a critical aspect while keeping to fast bowlers, probably as, if not more important than the mental aspect. If the keeper has got most things right; his feet are in line, he is well-balanced, he has anticipated the path and height of the ball, has got his body behind the ball and is concentrating well, what should he remember while catching the ball? 2. Keep the fingers pointed outwards. 3. Not to 'attack' the ball. The keeper should not try to 'snap' at the ball. He should remember that he is trying to catch a cricket ball and not kill a mosquito or catch a fish! If he does this, the chances of his dropping the chance increase, as does the risk of sustaining a finger injury. Misjudging the flight of the ball even slightly is sometimes enough to have a finger injury. Keepers need to get into a rhythm. This means that it is not so much necessary to practise catching balls hit as fast as a bullet, than to work on the correct movement of the hands and feet. The keeper should certainly make diving reflex catches a part of his practice session, but these diving catches should not dominate the practice session completely. One of the best ways in which a keeper can develop his technique is by taking a golf ball and bouncing it off a wall, so that it comes to him on the full. The keeper can wear inner gloves for this unique method of practice. He should not go out of his way to give himself difficult catches by bouncing the ball off the wall at different angles, or throw hard so that the ball rebounds to him like a bullet, but concentrate more on catching the ball, imagining that it is a cricket ball. This method will make it easier for him to visualize his sideways movements, technique, assess the way the ball is coming into the hands, and in the process, rehearse one's balance and rhythm. This method will be a lot more effective in improving his focus and concentration than having someone hitting 100 catches to him. The advantage of this method is that the keeper does not require someone else to help him out by giving catches or retrieving the ball. He can concentrate on bringing his gloves together and ensuring that his feet are moving in the right manner, without worrying about injury. There is no way he can get injured by a golf ball. For fast bowlers who specialize in bowling inswingers (to right-handed batsmen) that dip outside the leg stump, the keeper should be able to pick up the flight early and observe what the ball is doing. He should move to the leg side and get himself in the correct position to take the ball cleanly. This will give him the margin to move even further to the left to take the ball, if it is deflected by a snick or any part of the batsman's body. 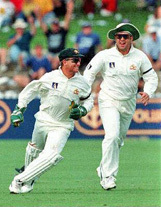 Don Tallon, the Australian keeper of Bradman's era, was brilliant at this. He often went so far to his left that he took the ball on his right side. But he held many catches on his left, which other keepers would not have reached. A wicketkeeper's greatest assets are energy, strength and enthusiasm. He should be ready to go for everything, be it a possible catch, a swinging delivery by the bowler or a return from the deep. "Hesitation", for him, should be an alien word.